Metallic ink adds sparkle to business cards. People can't resist tipping them back and forth to watch the light reflect off them. And when people interact with your business card, they're far more likely to remember you. Metallic inks contain tiny metal fragments that catch the light and make business cards glimmer in a delightful way. With a lower price point than foil stamping, metallic inks are an affordable way to give business cards a distinctive, eye-catching appeal. Metallics come in traditional silver and gold and a dazzling array of colors. Mix and match for creative effects. Add an additional aqueous coating to protect the metallic ink and keep the metal particles securely in place. Metallic ink has a strong impact, so keep the overall design simple and easy to read. Use contrasting colors, a simple font, and at least 8pt type. Your phone number. Include both work and cell if you prefer. Consider putting your photo on your business cards, especially if you frequently hand them out at industry or networking events. People have trouble remembering names, but the photo on your card will instantly remind them of who you are and what you talked about. 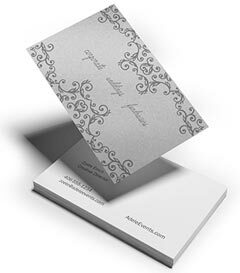 Use metallic ink on business cards to help promote your brand identity. Choose colors that match or complement your logo or that have specific connotations. Gold ink signifies wealth and luxury on a financial planner's card, while orange metallic ink might highlight flames on a fire alarm company's cards. The cards' shiny surface helps them stand out. Business cards with metallic inks also make excellent store or product promotions. Use them to advertise an upcoming sale, special event, or special offer. Keep a stack by the cash register and fasten one to each customer receipt. The reflective metal will catch customers' eyes and encourage them to come back. 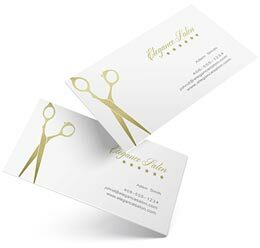 Business cards with metallic ink are also great for calling attention to loyalty cards, sprucing up hang tags and creating upscale product inserts. Our designers are experts at using metallic effects in creative ways that brighten up any business card sized project. Metallic ink gives business cards a memorable glitter that sets them apart from the crowd. Add metallic to your cards and you'll be sure to stand out. Have questions about using metallic inks?